A small and rather unassuming lane transports you from the neon-lit crush of Pub Street towards La Cabane La Cuisine des Filles, a one-minute walk in time and space and a world away in atmosphere and service. It's an unusual spot, having about it something of an air of the Mediterranean seaside with gaily painted yellow and orange corrugated walls that a large, open-plan room is able to carry off with ease. The Med-feeling continues inside with a decidedly French menu in elegant script on a large blackboard. But there's a very reasonable Khmer menu too, presented in a menu binder. On the French side, you'll find solid, unpretentious food like a green pepper terrine ($5), scallops with parsley ($7.50), or baked eggs with mushrooms ($4.50) to start with. For the mains, the offerings are hearty staples of French cooking, such as succulent home-made sausages with mustard and mashed potato ($7.50), boeuf bourguignon ($11), pork chops with mashed potato and mustard sauce ($9), or good old fish and chips ($8). This is not for those who faint at the sight of real butter, but definitely for people who love authentic French cooking. You can take things up a fancy notch if you like too, with a tempting shrimp bisque with scallops and foie gras ravioli (a starter at $9.50). On the Khmer menu, there is the same dedication to authenticity and generosity, with fresh, crunchy salads or traditional fish soups to start of with, as well as fried pork spring rolls ($5). On the mains, there is pork with caramel and mushroom, chicken with pineapple and cashew nuts, or beef with long beans and coconut milk, among others, all priced at $6 or $6.50. 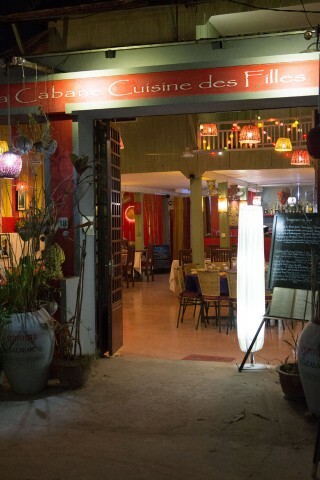 The service here is friendly and professional and the staff all speak extremely good English, French and Khmer. The set-up is not luxurious or sophisticated by any stretch, but it has a class of its own that reflects the honesty of the food and service. Credit cards are not accepted. They're open for lunch and dinner, closing from 14:00 until 18:00.